A meeting is not a meeting. Which raises the question: what are the different kinds of meetings? Since it isn’t useful to provide guidelines for all meetings, we have decided to establish useful guidelines for a certain type of meeting. Meetings are designed to beget action that is evaluated and built upon in subsequent meetings, and the sequence and cadence at which these meetings occur drives the momentum of that action. 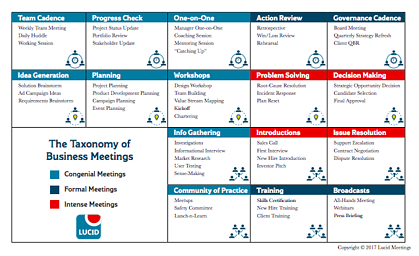 Download this Taxonomy of Business Meetings that contains an overview of all of the types, relationships between them, and examples of meetings for each type.